A new website was launched last week, called Palestine Is Here. Palestine is Here, a project of Researching the American-Israeli Alliance (RAIA), is a database tracking Israeli military ties to American local government, police departments, corporations, and academic institutions. 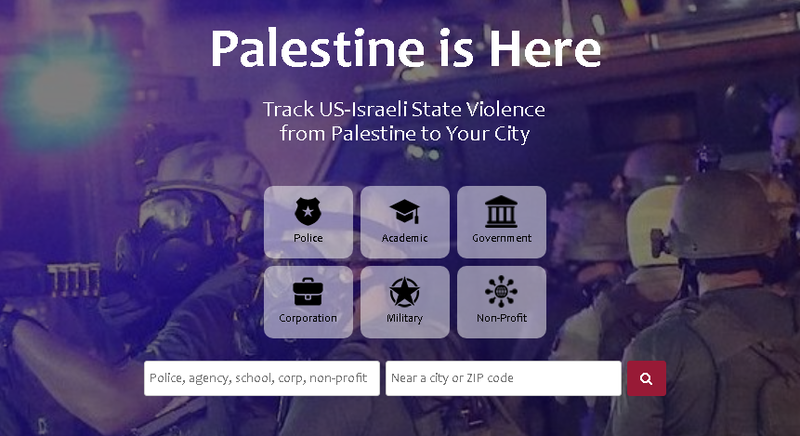 Using simple search algorithms to help activists expose the connections between American and Israeli state violence in their communities, the database works to support direct grassroots organizing to end US militarized trainings, academic collaborations, and technological exchanges with Israel. RAIA is a research initiative launched in 2017 dedicated to exposing the connections between American and Israeli state violence. Our work is grounded in the conviction that the ongoing dispossession and oppression of the Palestinian people undermines the possibility of a viable homeland for both Palestinians and Israelis. Embracing the 2005 Palestinian call for Boycott, Divestment, and Sanctions (BDS) against Israel until Israel ends its Occupation, grants full equality to its Palestinian citizens, and honors the Palestinian right of return, RAIA is committed to conducting research for the movement for justice in Palestine in the United States....RAIA seeks to raise awareness of the close collaboration between the Israeli and American governments to displace, surveil, and control communities of color and other marginalized populations in order to suppress popular resistance. The head of RAIA is a known and proven anti-Zionist Israeli Eran Efrati, formerly of Breaking the Silence and ICAHD. I revealed him to be an absolute liar a couple of years ago when he claimed, ludicrously, that religious Jews encouraged children to set fires to and urinate on, carpets in the second-holiest place in Judaism while it was packed with worshipers. The Palestine is Here site is another in a long series of well-organized initiatives meant to turn the very word "Israel" into a viscerally horrifying term. There is nothing wrong with US police attending seminars given by Israelis, which is the "crime" that the site is most concerned with now. As I've pointed out before, each US police department is responsible for its own rules of engagement, and taking a seminar in Israel doesn't make them change their policies. So far the site has listed over 250 US law enforcement groups that have had some exposure to Israeli teachers. The State Patrol of Colorado is among the departments that have sent delegates to Israel. The Colorado State Patrol has sent at least 2 officials to train in Israel. James M. Wolfinbarger served as Chief of the Colorado State Patrol between 2009 and 2013. Scott Hernandez served as Chief of the Colorado State Patrol between 2013 and 2017. Chief James M. Wolfinbarger attended a training in Israel in 2009 with the ADL as a delegate of the NCTS. Chief Scott Hernandez attended an NCTS training in Israel with the ADL in 2015. Chief Scott Hernandez’s training includes briefings by senior commanders in the Israeli police, military, intelligence and other security units. Chief Wolfinbarger’s training includes meetings with Israeli Brigadier Generals, police commanders and local government leaders, with visits to Israeli army command centers and holy sites. James Wolfinbarger is now in the private security sector, working as a Real-Time Crime Center (RTCC) Solutions Consultant at ŽMotorola Solutions, which supports command centers and fusion centers with technology and predictive policing. According to the ACLU, fusion centers can employ officials from federal, state and local law enforcement and homeland security agencies, as well as other state and local government entities, the federal intelligence community, the military and even private companies, to spy on Americans in virtually complete secrecy. One of the private companies that transfer technology to police departments is the Israel-based Cellebrite. Cellebrite is a “mobile forensics” firm that manufactures data extraction, transfer and analysis devices for cellular phones and mobile devices for law enforcement, military and intelligence, and corporate customers. Colorado State Patrol is one of the departments that uses Israeli private-sector technology. Colorado State Patrol spent $26,216 to crack into phones using Israeli tech firm Cellebrite, according to public record requests by Motherboard. California Highway Patrol uses Cellebrite’s technology to bypass phone passwords and security mechanisms to retrieve call logs, text messages, and in some cases even deleted data. The way information moves in Israel is much more fluid than it is here. They have a remarkable exchange of information between all levels of government and private industry… [T]hat’s something we can build on here.” ~ Chief Wolfinbarger on the advanced collaboration between the Israeli private industry and Israeli government in “counter-terrorism” and how the ADL helped them start thinking about how to apply these techniques in their local police departments. There is nothing that is illegal, immoral or even problematic in the slightest. Law enforcement is allowed to try to read information on the cell phones of suspects. It is allowed to listen to how other law enforcement agencies work. "Palestine is Here" is a sick attempt to blame Israel to domestic US problems with the aim of ensuring that stupid liberals will link hating Israel, the most liberal state in the Middle East and one that can claim in many ways to be more liberal than many Western European democracies, with all the causes they hold dear.